Partially diamond set wedding rings, an alternative to fully set diamond wedding rings, ranging from channel set half eternity ring designs, to simple designs with that extra little detail. Elegant baguette cut diamond wedding ring featuring 3 precision set baguette cut diamond side-by-side within a wide channel setting. Diamond twist wedding ring, grain set with 0.05cts of round brilliant cut diamonds. This elegant shaped wedding ring can be commissioned in a choice of 2.5mm or 3.5mm wedding ring widths. Elegant twist effect shaped diamond wedding ring with ribbon twist styling. Available in 2 width choices, 2.5mm or a wider 3.5mm option. Holds 0.05 carats of round brilliant cut diamonds across the central raised detail of the ring in grain setting. Available in optional metal choices. Please allow 3-4 weeks for completion. A beautiful grain set diamond wedding ring in a vintage style bow-tie shape. Available in 2.3mm or 2.7mm widths. Diamond set with 0.12cts of dazzling GVS brilliant cut diamonds. Shaped to fit an existing engagement ring. Also available custom made to a precise fitting. Contact us for details. Open channel set 3 stone diamond wedding ring featuring 3 spaced 2mm round brilliant cut diamonds across an extending open channel with D shaped ring profile. 3mm open channel set diamond wedding ring. This ring design holds 2mm round brilliant cut diamonds beautifully spaced within a completely open channel across this beautiful D shaped profile band. The total diamond weight is 0.06 carats with G colour and VS clarity for the matched set of diamonds. Timescale is typically 4 weeks for this design. Elegant Marquise and round brilliant cut diamond set wedding ring flush set. Set across a substantial 3mm heavy slight court wedding ring, this attractive design features small marquise diamond and small round brilliant cut diamonds, flush set across the upper section of the plain wedding ring. A perfect finish is provided across this exceptionally pretty design in a range of metal choices with a total diamond weight of 0.22 carats, created with G colour and VS clarity diamonds. Please allow 3 - 4 weeks for this ring. Wide 7mm flat court wedding ring created with 0.16 carats of round brilliant cut diamonds, pavé set into a squared central pattern. Flat Profile. 7mm width. 25 Round diamonds pave set. 0.16ct weight. G colour VS2 clarity. Available in 18ct White Gold, Yellow Gold, Palladium and Platinum. Supplied in Wood box. Gift packaged. 3-4 weeks delivery. 7mm wide flat court diamond wedding ring set with a squared arrangement of round brilliant cut diamonds 0.23cts in total. Flat Profile. 7mm width. 35 round diamonds. 0.23cts weight. G colour VS2 clarity. Available in 18ct White Gold, Yellow Gold, Palladium and Platinum. Supplied in wood box. Gift Packaged. 3-4 weeks delivery. Knife edged profile wedding band with flush set single round brilliant cut diamond across a 3mm wide ring band. Knife edge profile. Diamond set. 0.03cts round diamond. G colour VS2 clarity. Approx 3mm width. Available in 18ct White Gold, 18ct Yellow Gold, Palladium and Platinum. Wood boxed, gift packaged. 0.20cts princess cut diamond half eternity ring, with princess cut diamonds held within a 2.55mm wide band. Channel Setting. 0.20cts diamonds. Precision set. 2.55mm width. Princess Cut diamonds F colour VS1 clarity. Available in 18ct Yellow Gold, 18ct White Gold, 950 Platinum and 950 Palladium. Wood boxed. Gift packaged. 3 weeks for delivery. A simple channel set diamond wedding band in a lightweight court profile band. Mens 3 stone diamond wedding ring featuring 3 princess cut diamonds, channel set into a unique 6.8mm ring design. 3 x Princess diamonds. 0.10cts total weight. F colour VS1 clarity. Flush precision setting. 6.8mm ring width. Flat court profile. Satin outer finish. Available in 18ct Yellow Gold, 18ct White Gold, 950 Platinum and 950 Palladium. Wood boxed. Gift packaged. 3 weeks for delivery. Unisex diamond wedding or eternity ring, holding 0.08cts of small round brilliant cut diamonds within a 5.85mm wide band. Unisex design. 0.08cts round diamonds. F colour VS1 clarity. 5.85mm ring width. Court profile Border detail. Pave setting. Available in 18ct Yellow Gold, 18ct White Gold, 950 Platinum and 950 Palladium. Wood boxed. Gift packaged. 3 weeks for delivery. A distinctive baguette cut diamond wedding ring for me, featuring a 5mm band with 3 x flush set baguette cut diamonds held within a flush setting. Choose from a wide choice of precious metals for this sleek and styling diamond wedding ring. Baguette cut diamonds. 0.20cts total diamond weight. Precision flush settings. F colour VS1 clarity. 5.0mm ring width. Flat court profile. Available in 18ct Yellow Gold, 18ct White Gold, 950 Platinum and 950 Palladium. Wood boxed. Gift packaged. 3 weeks for delivery. 5 stone diamond wedding ring, created with a matching set of round brilliant cut diamonds, weighing 0.20 carats spaced out and flush set across a 4mm or 5mm ring design. 5 stone flush set diamond wedding ring, elegantly precision set with 5 round brilliant cut diamonds, 2.2mm each across a choice of 4mm or 5mm flat court wedding ring. Each ring is created to your precise metal and width choices, with the finest G colour and VS clarity diamonds. Please allow 3 - 4 weeks for this ring design to be made. Men's diamond set wedding ring, featuring 0.18cts of round and baguette cut diamonds flush set within a 5.85mm flat court band. Round & Baguette diamonds. 0.18cts diamonds. F colour VS1 clarity. 5.85mm ring width Satin outer finish. Precision setting. Flat court profile. Available in 18ct Yellow Gold, 18ct White Gold, 950 Platinum and 950 Palladium. Wood boxed. Gift packaged. 3 weeks for delivery. Men's wedding ring precision flush set with a 0.06ct princess cut diamond, 5mm wide band and bevelled edge detail. Princess cut diamond. 0.06cts diamond 2.3mm. F colour VS1 clarity. Precision setting. 5mm ring width. Bevelled edge detail. Satin/Polished finish. Available in 18ct Yellow Gold, 18ct White Gold, 950 Platinum and 950 Palladium. Wood boxed. Gift packaged. 3 weeks for delivery. 5mm men's diamond wedding ring, set with 0.07cts flush set princess cut diamond, between machined detail with combined satin and mirror finish. 0.07cts Princess cut. F colour VS1 clarity. 2.6mm diamond. Flush central setting. Court profile Partial satin finish. Three section detail. 5mm ring width. Available in 18ct Yellow Gold, 18ct White Gold, 950 Platinum and 950 Palladium. Wood boxed. Gift packaged. 3 weeks for delivery. Flat court wedding ring, flush set across the band with a single 0.06 carats baguette cut diamond. This simple wedding ring design is created with a flat court profile wedding ring, using a beautifully white baguette cut diamond, weighing 0.06 carats flush set across a 4mm wedding band. This design can be created in differing metal choices and finger sizes. Please allow 4 weeks for this item to be produced. A flat court profile wedding ring, flush set with a single 2mm square princess cut diamond in a very simple and understated design. This very elegant, understated diamond wedding ring design can be created in 4mm or 5mm width options across any choice of precious metal. A single 0.05 carats princess cut diamond is flush set within the ring with precision setting in a very elegant design. Please allow 4 weeks for this ring style. An elegant flush set princess cut diamond wedding ring created with 3 spaced, flush set square princess cut diamonds 2mm each. This elegant diamond set wedding ring is available in 4mm and 5mm wedding ring widths. This flat court profile band is set with 3 x 2mm square princess cut diamonds precision flush set in very pretty and elegant wedding ring design. Available across many metal choices in under 4 weeks for completion. 4 stone princess cut diamond wedding ring with 0.25 carats of flush set princess cut diamonds over a flat court comfort fit 4mm or 5mm wedding band. A unique 4 stone princess cut diamond wedding ring. This style features a flat court profile wedding ring, flush set with square princess cut diamonds, oriented in diamond shapes cut into the surface of the band. Each diamond measures 2mm and we can create this design in 4mm or 5mm widths. Timescale is typically around 4 weeks. Princess and round brilliant cut diamond wedding ring set with alternating diamond shapes flush set across a court profile band. 4mm or 5mm flat court profile, 3 princess diamonds, 2 round diamonds, Available in most metal choices and finger size options. Precision set design featuring alternating shapes of round and princess cut diamonds across a flat court profile band. A flat court profile wedding ring with graduated flush set round brilliant diamonds. 5mm flat court profile. Heavy weight design. 0.08cts weight comprising 1 x 2mm diamond and 6 x 1.3mm diamonds. G colour VS2 Clarity. Available in 18ct Yellow Gold, White Gold, 950 Palladium and 950 Platinum. Wood boxed, gift packaged. 3 weeks delivery. The diamond scatter wedding ring features an assortment of round brilliant cut diamonds, beautifully spaced and flush set within a 5mm wide flat court profile band, available in a choice of precious metals. Featuring a comfortable flat court band, the diamond scatter wedding ring dazzles with five flush set round diamonds, VS2 clarity measuring 1mm, 1.3mm, 1.5mm, 2mm and 2.5mm held within a 5mm band with a polished edge. A flat court band wedding ring set with 3 different diamond shapes For the diamond shape connoisseur. 5mm width. 1 x baguette diamond. 1 x princess diamond 1 x round diamond. Available in 18ct Yellow Gold, White Gold, Palladium and Platinum. Supplied in wood box, Gift packaged. 3 weeks for delivery. Beautiful 0.25 carats flush princess cut diamond set wedding ring created in an optional 4mm or 5mm flat court profile band. 5 beautifully matched princess cut diamonds, flush set, spaced along the top of a 4mm or 5mm flat court profile wedding ring band. Each diamond weighs 0.05 carats and is 2mm in size. G colour VS2 purity. Diamonds are 0.25 carats in total weight. Please allow 4 weeks for this design. 6mm Diamond wedding ring, flush set with a square of 3 x 3 round diamonds 1.3mm each 0.06 carats in total within a flat court band. 6mm flat court wedding ring, created with 6 round brilliant cut diamonds, G colour and VS clarity. Available in 18ct White Gold, 18ct Yellow Gold, 950 Palladium and 950 Platinum. Square arrangement of flush set diamonds 1.3mm each in size. Set with a single 3mm 0.10cts diamond, this 5mm patterned wedding ring is flush set, and machined with a simple three section design. Central diamond. 0.10cts 3mm. F colour VS1 clarity. Precision flush setting. Three section detail. Polished finish. 5mm ring width. Available in 18ct Yellow Gold, 18ct White Gold, 950 Platinum and 950 Palladium. Wood boxed. Gift packaged. 3 weeks for delivery. Flush set 5.75mm men's diamond wedding ring with 2.6mm 0.07cts round diamond within a satin finished channel detail. 5.75mm ring width. 0.07cts round diamond. F colour VS1 clarity. 2.6mm diamond width Precision flush setting. Central matt channel detail. Outer polished finish. Available in 18ct Yellow Gold, 18ct White Gold, 950 Platinum and 950 Palladium. Wood boxed. Gift packaged. 3 weeks for delivery. Men's 5.9mm wide band, set with 4 round diamonds arrange in a quadrant design, 0.12cts in weight, with satin ring finish Four round diamonds. 0.12cts total weight. F colour VS1 clarity. 4 x 2mm diamonds. 5.9mm ring width. Flat court profile. Satin finish. Available in 18ct Yellow Gold, 18ct White Gold, 950 Platinum and 950 Palladium. Wood boxed. Gift packaged. 3 weeks for delivery. Men's wedding ring, with 4 diamonds straight set at intervals, 0.33cts total diamond weight within a 5.75mm ring width. Four round diamonds. 0.33cts diamonds. F colour VS1 clarity. 5.75mm ring width. Square flush settings. Flat ring profile. Satin finish. Available in 18ct Yellow Gold, 18ct White Gold, 950 Platinum and 950 Palladium. Wood boxed. Gift packaged. 3 weeks for delivery. Men's diamond wedding ring, with a flat court profile and 0.10cts of graduated diamonds channel set across a 6mm band. 0.10cts diamond weight. F colour VS1 clarity. Graduating sizes. 6mm ring width Flat court profile. Available in 18ct Yellow Gold, 18ct White Gold, 950 Platinum and 950 Palladium. Wood boxed. Gift packaged. 3 weeks for delivery. A Wide two Colour Wedding Band set with Diamonds. 18ct Yellow Gold & Platinum, 10mm wide, Two colour design, 3 round diamonds, 0.09cts total, G colour VS2 clarity, Size N 1/2. 14.5g weight. Wood boxed and gift packaged. Beautiful 4mm flat court profile wedding ring set with a single 2mm square princess cut diamond in an elegant design. Unique flat court profile diamond wedding ring, holding a single 2mm princess cut diamond, beautifully styled with open edges either side of the flush bezel set princess cut diamond. With carat weight of 0.05 carats the diamond sits perfectly within the 4mm flat profile band. Wedding rings usually fall into three main categories, these being wedding rings without diamonds and wedding rings that are set around the entire circumference of the band, and those we are concerned with here i.e. partially set designs, where diamonds feature, but not around the entirety of the band. There are plentiful options here, with accented rings nestled alongside diamond focused designs with more elaborate arrangements, and both quantity, shape of the band and shape of the diamond can vary greatly based on preferred design. Where a part diamond ring sits alongside an engagement ring created with shoulder diamonds, in all likelihood, some degree of custom design will be advisable, to ensure the area set with stones across both rings will line up in matched harmony. 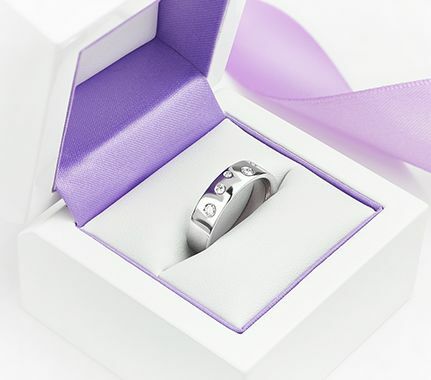 This is an add-on service we offer for any ring design requiring a greater degree of personalisation towards the wedding day, and the diamond element of the ring can be either part grain set, part channel set or partially claw set. We also create many custom ring designs with flush set diamonds spaced around the ring which can be seen on our bespoke page.